Time to celebrate a pioneer: if you do production in New York or LA (or as of last August–Chicago), you know that camera rental/sales house Abel Cine Tech long ago became one of the top go-to facilities for indie productions. They’ve become known for a personable, low-key style that goes easy on the hype while never putting off newbies with a know-it-all attitude. 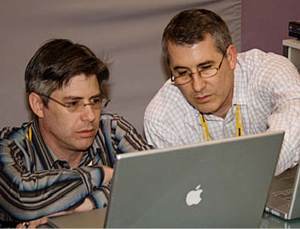 The company’s regular efforts at educating the production community with classes and demos are acknowledged resources for anyone delving into the latest technology. Abel Cine Tech, now based at 609 Greenwich Street, is certainly “passionate about bringing new technology to the production community” as Pete Abel recently said. That doesn’t mean Abel Cine doesn’t play well with the big boys: the company offers full sales and service for various Panasonic and Sony cameras, along with package support and services for RED and the high-speed Phantom. Be sure to check out Abel Cine’s tech blog regularly for info on new gear. Meanwhile, their downloads page helps keep track of camera firmware upgrades for Panasonic, RED, and Sony cameras. Let’s wish them 20 more good ones.